The puppy meadow has many attributes, such as a large tube the puppies can run through and hide in, a sandbox to dig in, and balls and flossy rope toys they can play with. In short, the life of a Dalmacademy’s Dalmatian puppy is carefree and fully equipped. Besides playing in the puppy meadow, the puppies can in turn run through our own piece of woods with the big dogs, and look for sticks, and smell for rabbits and hedgehogs. Once the puppies get their first shots and are a little bit older, they will go in the car to the real big woods. It’s a lot of fun for them to be allowed to discover things in the woods with the big dogs. If the weather is nice, we take the puppies to a shielded area where dogs can go from a little gently sloping beach into a little lake to learn how to swim. You can imagine; that’s a lot of fun. Some puppies walk straight into the water after their mother and make their first swimming strokes. Others continue to yap on the shore and then try to gently put their paws in the water. 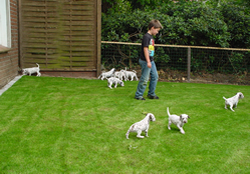 The free outdoor life our kennel offers, provides an excellent start for your Dalmatian puppy.